Due to Sarah’s travel schedule, we were unable to have a client of the month for February. But just slipping in the end of March, we are excited to present to you LaToya. There are so many reasons I want to introduce you to her. First of all, she is a total inspiration. This girl can do just about anything, and do it well! This year she launched her business www.ihearthair.com, she helps plan weddings, and I can even ask her questions about quickbooks (accounting software for those of you lucky enough to not know what it is)! When I think of someone who seems to strike that perfect balance of busy go getter, that still knows how to take care of herself and have fun, it is LaToya. And to top it off she is walking billboard for Flawless Lashes. She just has those eyes that people are instantly drawn to, and she is constantly asked about her lashes! Here is a little more info about LaToya, and photo of her gorgeous eyes! I’m a 30-something marketer, consultant, and social media maven plus the co-owner of I Heart Hair, Inc., online hair extension company. I also enjoy working out, reading, traveling, shopping, and spending quality time with friends and family. I love that my lashes are a natural extension of my lashes for the last 2 years. They help me to have a complete look even on the no make up days. I care for my lashes my washing them thoroughly every morning and evening with Bella B – Bee Gone Cradle Cap Shampoo. I use this shampoo to minimize buildup and natural skin shedding. It’s very gentle and reasonably priced. I also brush through my lashes in the morning and evenings but most importantly I don’t wear mascara (a personal choice). I find that by not wearing mascara my lashes last longer and appear very natural. 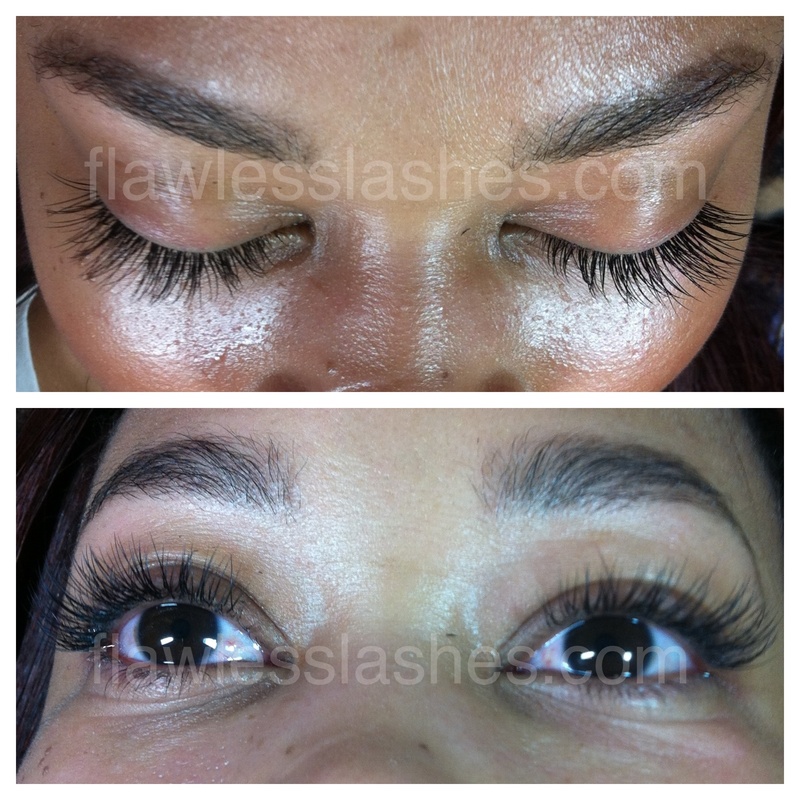 Thanks to LaToya for being a great Flawless Lashes client!